My Mama and I have been reading magazines for so many years, it’s kind of ridiculous. I pretty much stick to the food, and do it yourself Martha types. Every month without fail we cut out recipes, and organize them into their respective categories of dishes to try and test out for the blog or what have you. Inevitable they sit there, untested for a looonnnggg time. Long long time. I have thousands of recipes, not exaggerating, ask Brian. She always has a stack of newspaper clippings and magazine clipping waiting for me in a folder when I go visit. Which by the way I get to to go see her, my brother, Rob, and my bestest friends after finals this week, YES! We make many recipes together when I am at her house, so I rarely blog about it. For some reason that is my Mama time, and I don’t pick up the camera to take time away from it, it’s just a thing. I have cookbooks I use, I develop recipes I use, I am writing recipes constantly. For some reason I have an impulse to cut these magazine recipes out every month, and not use them. They are seriously tasty looking or sounding, but they wait patiently for me to get to them. The wait is over! I did it! AND am blogging about it, so what’s up now?! I thought I would share this awesome spicy recipe with you. It was a beautiful day for this kind of a recipe too, healthy, awesome for leftovers, and so so so good. It is a keeper people, try it and let me know what you think? I served it with rice noodles, and the leftovers with steamed brown rice. 1. Cut pork into 1 inch cubed pieces, set side. Combine the chicken stock, lime juice, lime zest, soy, and Sriracha in a bowl, mix well. 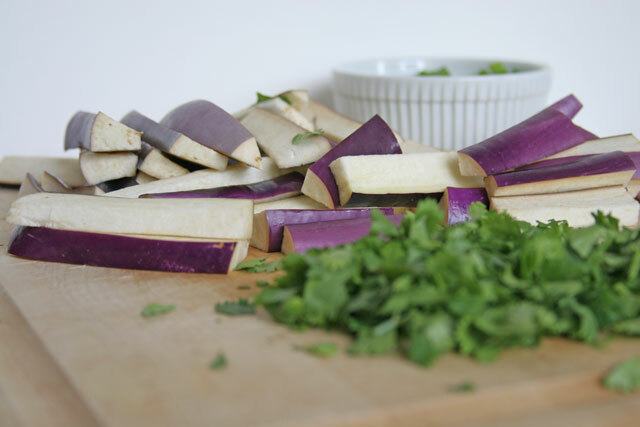 Cut eggplant into long strips about 1/2 inch thick, 2 inches long. Set aside. 2. Heat a wok or large frying pan with 1 tbsp grape seed oil. Once the pan/wok is hot, add the pork, season with 1/2 tsp salt, cook for 6-7 minutes on medium high heat. Add 1/4 cup of the Sriracha mixture and cook for a few minutes until the liquid evaporates. Remove from pan, set aside. 3. Return pan to heat, add 2 tbsp of grape seed oil. When the pan is hot, add the eggplant, cook over medium high heat for a few minutes, stir occasionally. Add 1/4 cup of water, and cook for 5 more minutes or until the eggplant is tender, and browning. 4. Turn the heat down to medium low, add the pork and 1/2 of the remaining lime/Sriracha liquid to the pan with the eggplant. Cook for a few minutes. Add the rest of the lime liquid, and a few pinches of scallions, just to warm them up a bit. Stir. Turn heat off, and serve. 5. Serve with the scallions, cilantro, and a lime wedge over rice, or rice noodles. This looks so delicious. I have never thought about having eggplant and pork together but I am loving the idea. Thanks! I don’t think I’ve ever cooked with eggplant yet! That really needs to change though – starting with this awesome recipe. I absolutely love all the flavors in this. Omgosh this is seriously the perfect dish to start with. 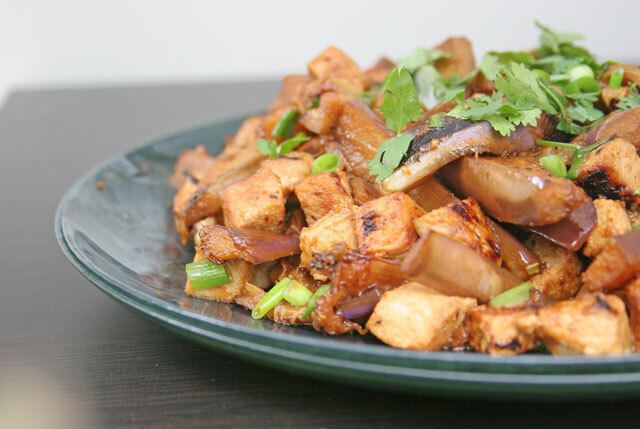 Japanese eggplant is easier to work with, and the sauce makes them sooooo good. I hope you like it! I love eggplants and never thought of using pork with it. Looks delish! Thank you Kiran, the pork works really well with it. I love Japanese eggplant, so good!